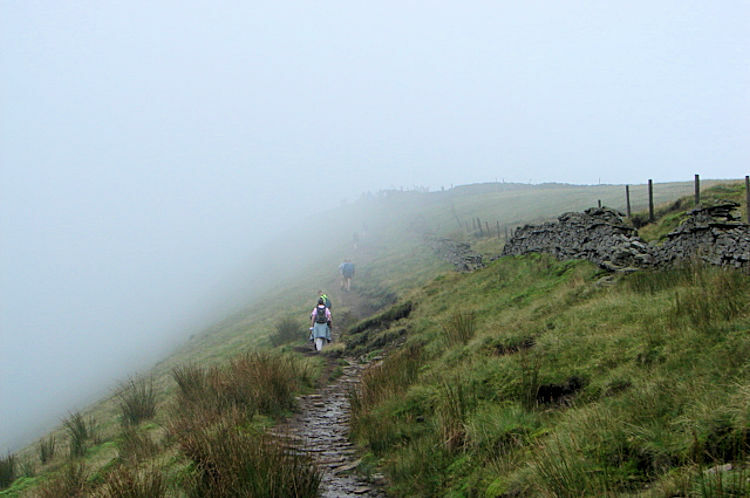 Summary: This is undoubtably the most formidable challenge walk in the Yorkshire Dales. The walk is approximately 25 miles in length depending on the slight variations available on the route. 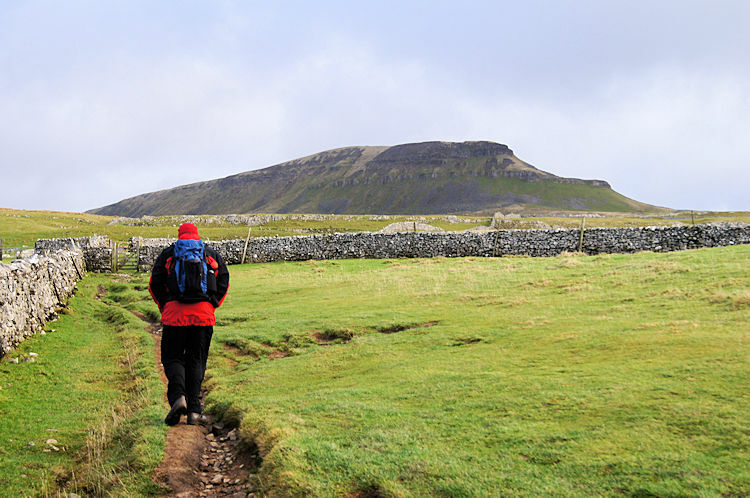 What is compulsory though is that you must climb Pen-y-ghent (694m), Whernside (736m) and Ingleborough (723m). It is a long walk and it includes an awful lot of climbing with the same amount of descending. The fact is that you need to be fit for this epic walk. It is a full day of walking you will be undertaking should you choose to do it. Though I am not one of the collectors of trophies there is an accomplishment badge to be earned if you register at the starting point of the walk and if you can complete the walk in under 12 hours. 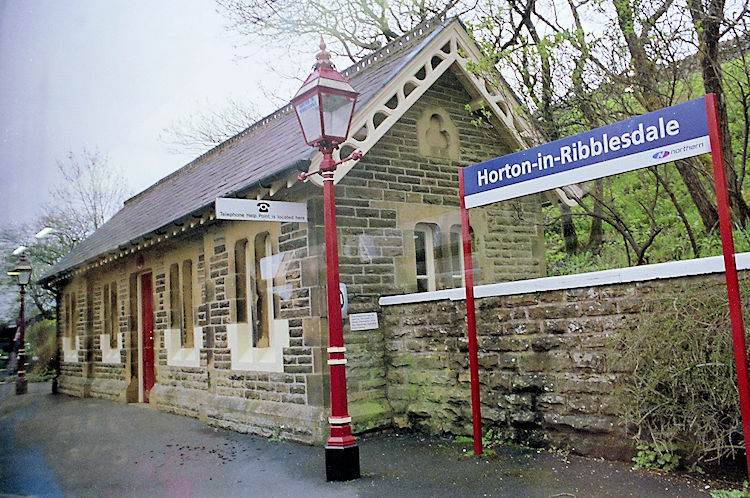 Starting at Horton in Ribblesdale the walk takes you on a superb circular of the hills. I have done the walk in both directions on a number of occasions. I never tire of the unique experiences to be gained from untaking the walk. 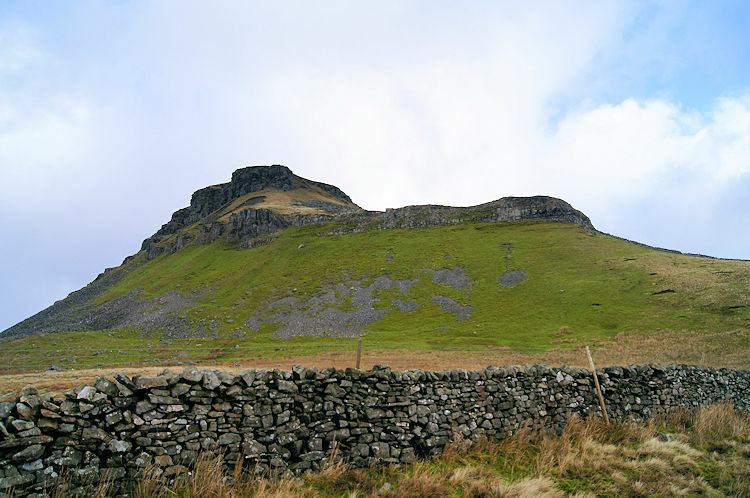 The walk is traditionally and best started from Horton in Ribblesdale from where you track to Pen-y-ghent via Brackenbottom climbing to Brackenbottom Scar steadily until you reach the joining of paths with the Pennnie Way at which point the imposing face of Pen-y-ghent looks down on you. 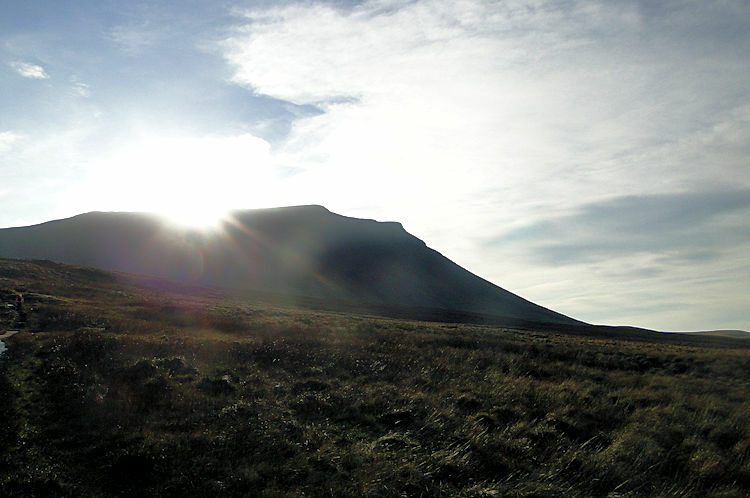 Scale up the steepening face of Pen-y-ghent to the plateau on top of the mountain and then walk to the trig point. 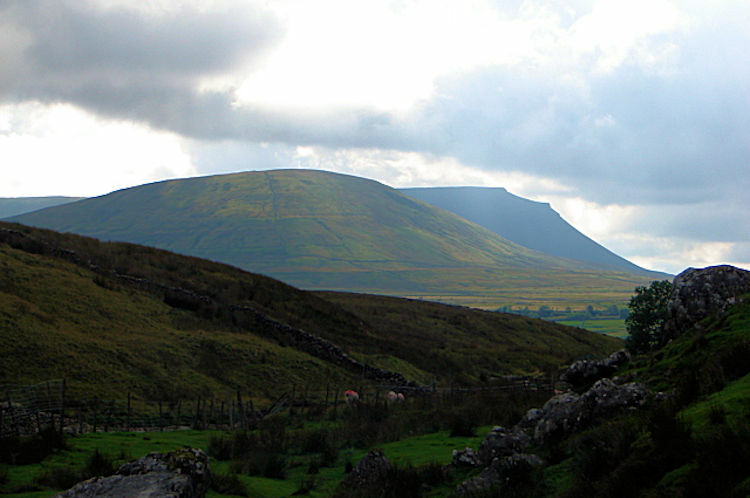 You will be exhilarated and warmed up now for the long haul to Whernside. 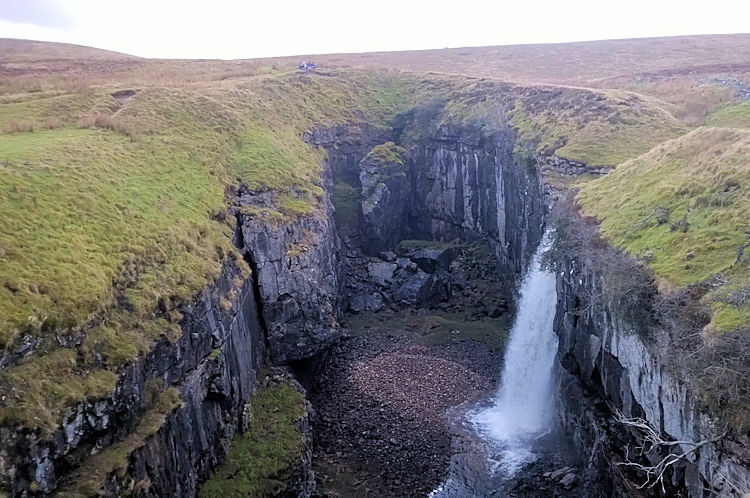 Head down from Pen-y-ghent on the due west path and if you can take the time to visit the brilliant sink hole of Hull Pot (map ref SD824747) near to where the Pennine Way is crossed. As you approach the pot you wonder where it is but then the sound of the water leads you in. Be careful as it opens up very quickly in front of you to reveal the abyss below. Once you leave Hull Pot the tracks can become less distinct though the paths which were once difficult to follow on this section and often under a quagmire of mud have been improved. If you have time I recommend a detour from Dismal Hill to the lovely Ling Gill (SD802786). Not too long a detour though as there is still a serious amount of walking to do! 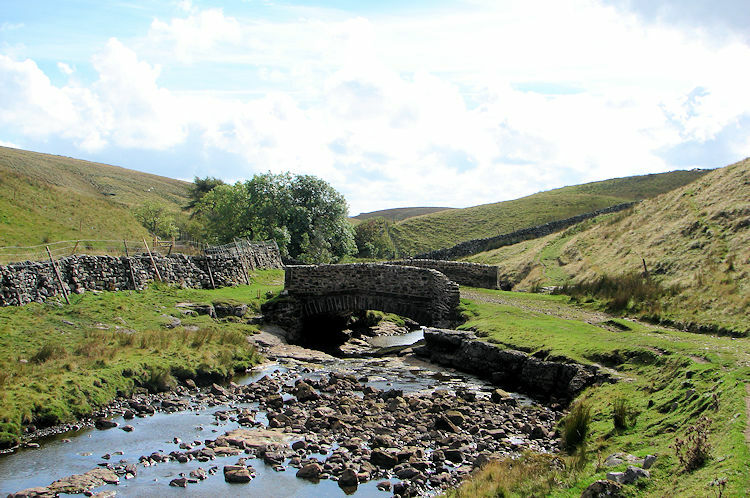 After retracing your steps to Dismal Hill, if you have visited Ling Gill that is, or if you have not detoured at all, follow a track from Dismal Hill to Nether Hall and then on to Lodge Hall before reaching the B6479 and following it north to Ribblehead Viaduct. 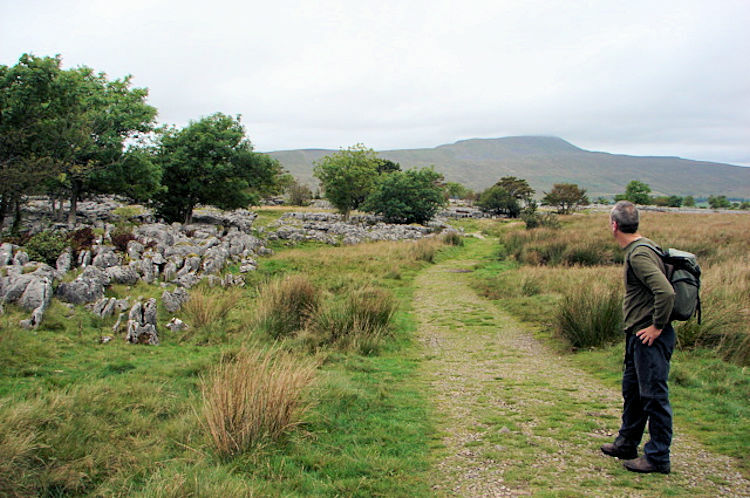 Look east as you do to spot Ingleborough for the first time asd it appears from behind Simon Fell. 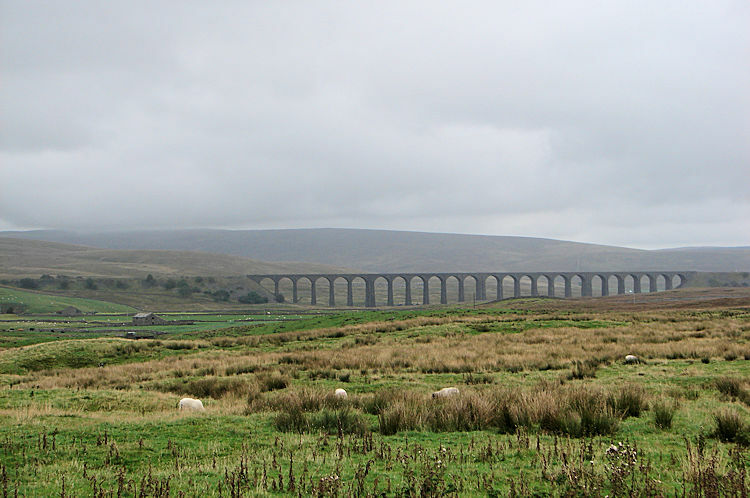 You cannot miss the beautiful and awesome sight of Ribblehead Viaduct. 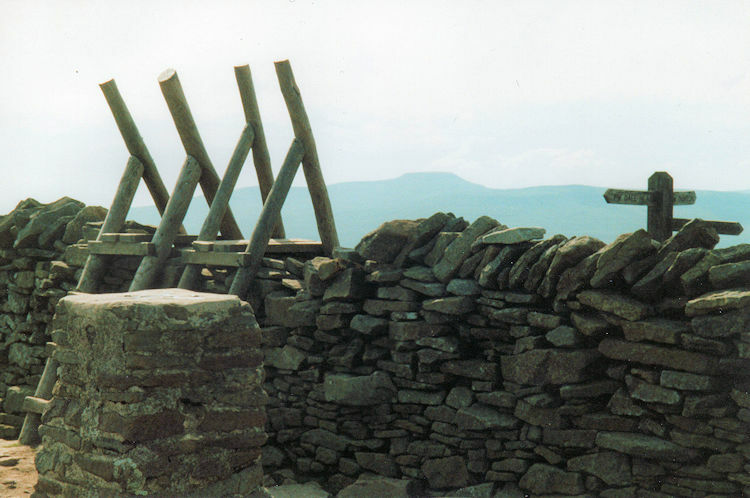 It is a wondrous sight and you can allow yourself a break to look at the structure as you prepare yourself for the long haul up Whernside via a walk near to the railway line past Blea Station and up the Dales Way track before leaving it after sighting Force Gill to your left. The walk up is not too difficult but it is a monotonous ascent which I have seen sap the strength and spirit of many an unprepared Three Peaks challenger. 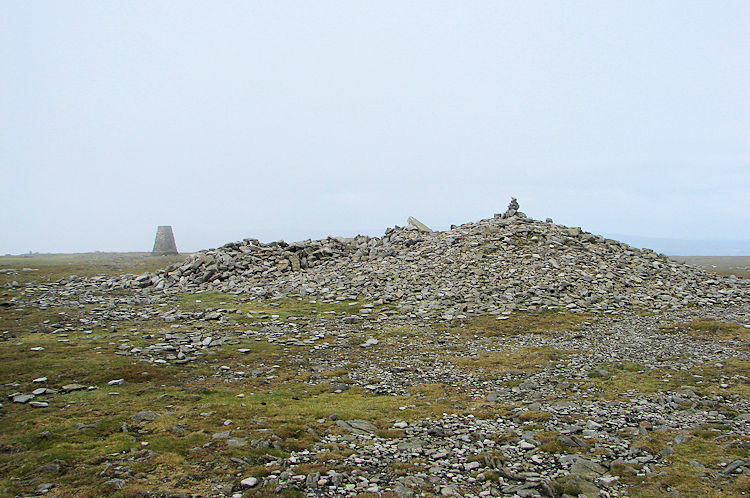 Once you have reached the summit of Yorkshire then take a break at the trig. You will have deserved it. If the weather is clear look over to Ingleborough while trying to imagine there is no valley below to drop down to which you will then have to climb out of. 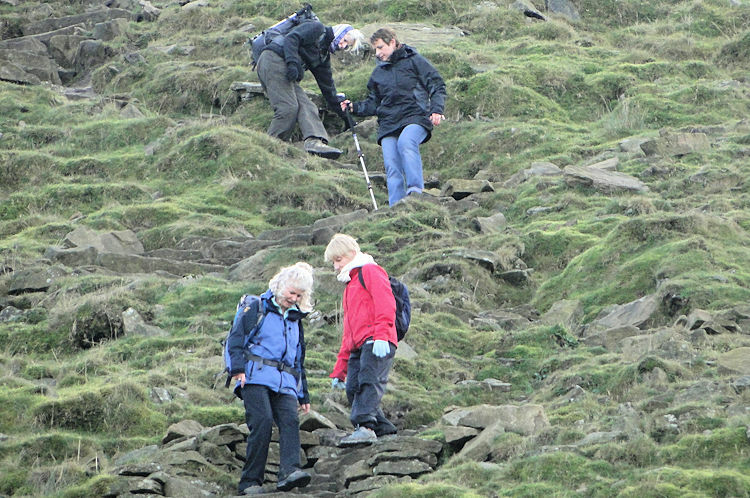 Leave Whernside in your wake and after a little walk along its ridge descend down a steep path (be careful in the wet as it can be very slippery) to Philpin Farm. 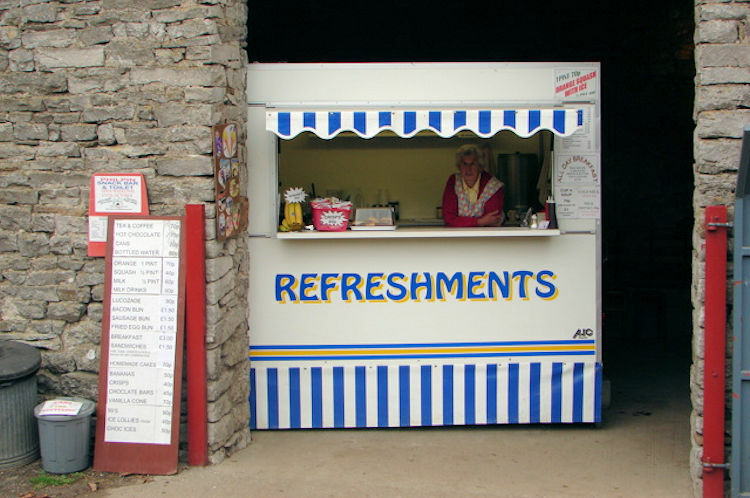 Philpin Farm has a welcome refreshment caravan at an appropriate quick break spot (open between April and October at weekends and Bank Holidays only). The refuelling will do you good for Ingleborough is a good climb once you have passed the Hill Inn at Chapel-Le-Dale (pints at your peril). The climb from Souther Scales to Ingleborough used to have an awful length of duck boarding which is now thankfully paved and after a half mile of gentle gradient is over it is a good old steep ascent to the top. Huff and puff if you must, it is the last climb of the epic walk. On the table top plateau of Ingleborough itself you will be blessed by, weather permitting, brilliant views including hernside, all of Ribblehead including the viaduct, a panorama of the Dales and on a good day the hills of the Lake District too. While you celebrate the achievement of capturing the Three Peaks do not forget there is still some six miles back to Horton, all downhill and on the route back are some great examples of Limestone Paving. And so to the biggest single day walk of the year. 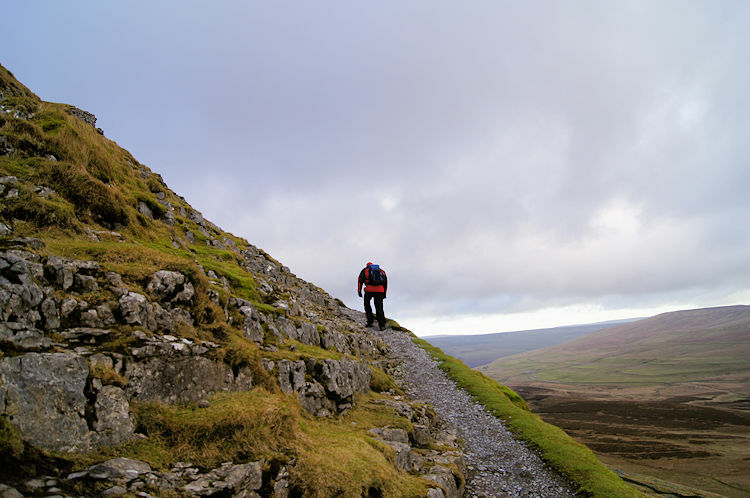 The classic 25 miles circular that is famously known as the 'Three Peaks', which involves climbing the three most popular hills in the Yorkshire Dales. Steve and I had this one planned since late last year. 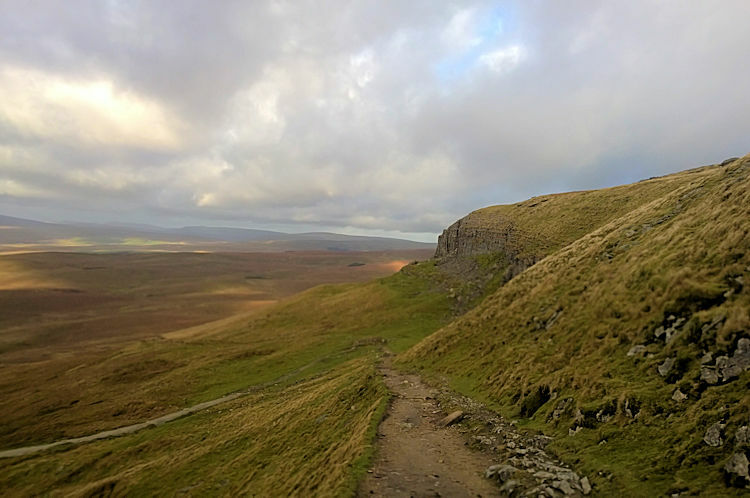 We usually climb Pen-y-ghent on New Years Day but decided to leave it this year so I did not have to do it twice during my '50 peaks in 50 weeks' challenge. In the weeks leading up to the walk it was envisaged four of my walking chums would do it with me but at the last minute two dropped out. Perhaps it was the weather that put them off. The days leading up to the walk were glorious but alas overnight the clouds rolled in. Resolutely the remaining three walkers, Steve, Dave and I hoped for a dry start. After an evening in Settle we were due to get up at 4.30 in the morning in order to meet Jess and Deke at 5.00 am. We slept in to 5.30, but after rushing up we got to Horton just before 6.00 am. After checking to find that Deke and Jess had not arrived we prepared in the village and at five past six set off towards Pen-y-ghent. 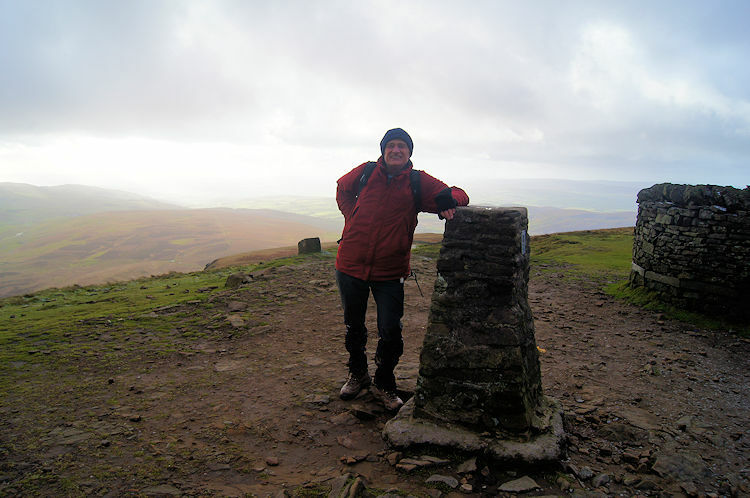 At least we had dry spells on the first pull to the top and we reached the trig point at Pen-y-ghent in good time. All still in good spirits although Dave was up to his usual morning grumble because he had missed his regular caffeine fix. 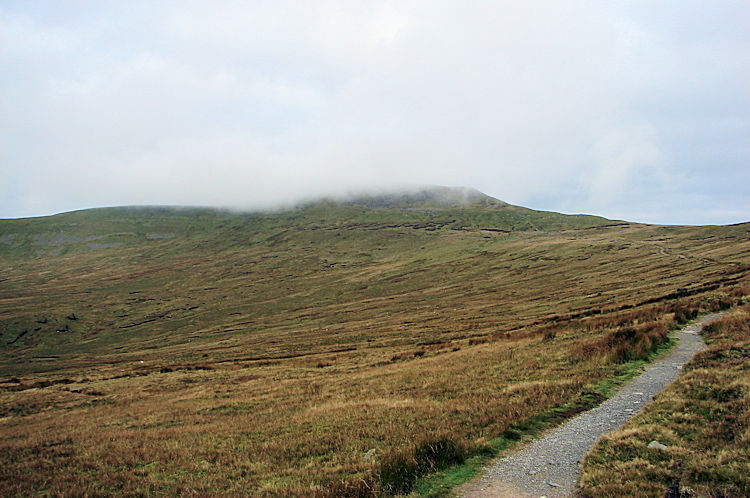 We then headed across country towards Whernside via the Pennine Way and Ling Gill, a lovely picturesque nature reserve on the route approximately half way between Pen-y-ghent and Whernside. It was there we had our first food break, and then on towards Ribblehead via Cam End and the Dales Way. After a short spell on the road near the viaduct where we passed a vintage car rally it was up towards redundant Blea Station on the Settle to Carlisle railway line. 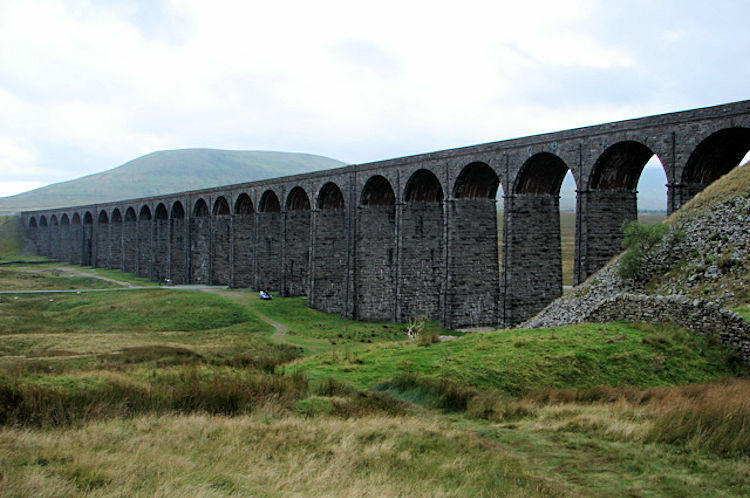 Then under the railway we went and set off on the long haul up to Whernside. I pumped up to the top where it was very windy and continued on regardless to the trig point. I quickly dived over the wall for shelter from the wind and took in more food. Whilst eating I was hassled by two sheep and one in particular was very brave in asking for a bite. Then Steve and Dave arrived and they were hassled too. It turned out they had crossed to the other side of the wall as soon as they got on the ridge to avoid the wind. Being blown almost over added to my achievement, so I was glad I had stayed on the windy side. Then it was the descent to the Hill Inn and during that spell we stopped off at Ivescar Farm where a sandwich bar had been set up for coffee. 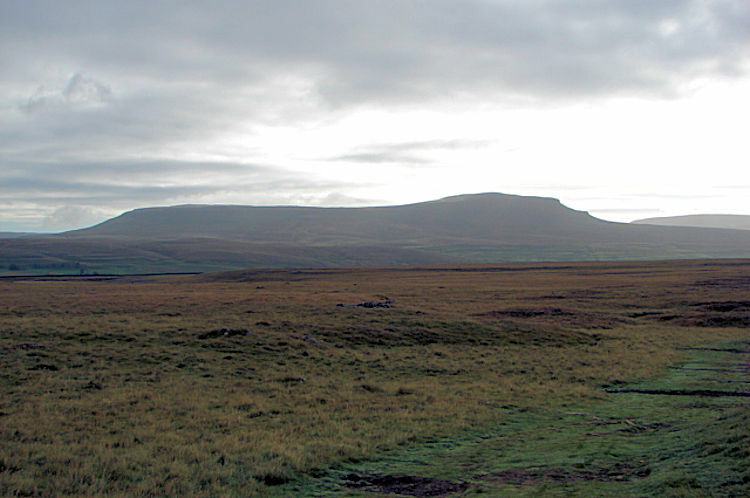 Quickly past the Hill Inn on resumption, and then the last pull to Ingleborough. All together to the duckboards and then Steve goes on. As Steve had stayed with Dave when he struggled up Whernside I decided to hang back behind Dave on this one to offer encouragement. Slowly but surely he clambered up towards the top ridge. On one occasion he called back to me 'I am knackered, I can't go any further' and then he laughed as he knew he had no choice but to continue. Twenty minutes later we were on top of the hill at Ingleborough's trig point in thick cloud where we couldn't see more than 15 feet. We took a quick bite of our remaining provisions and then walked straight down off Ingleboroughs table top before continuing on our journey back to Horton. It was then that my knees began to hurt on the downhill tramp. They often do on a long walk and this was without doubt a long walk. After another 4 to 5 miles which included some limestone flats we arrived back from whence we came, 10 hours after we had left. We had all done well and we had earned the drinks that followed in the evening.